BORDENTOWN, New Jersey — Prince Global, a leading tennis equipment and footwear company, and a wholly owned subsidiary of Active Brands Company, announced today it has renewed a partnership with record-breaking American doubles team and 2012 U.S. Open Men’s Doubles Champions, Mike and Bob Bryan. The Bryan Brothers will continue to use Prince’s EXO3 Rebel 95 racquet and Beast XP string to maximize their performance. 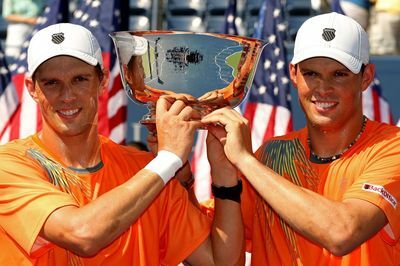 In winning their fourth U.S. Open title, the Bryans have won 12 grand slams, more than any other team in the Open era. The partnership also calls for the Bryans to become increasingly involved in Prince’s promotional and social media activities. At the 2012 U.S. Open, they participated in a live tweet event from the player’s lounge with Prince’s Twitter followers. “Bob and I love chatting with fans,” said Mike Bryan. “We are eager to hear what other plans Prince has for us. We love getting out there and doing different things with everyone.” The Bryans will get that chance later this year when they will host a private clinic for Prince contest winners from around the country. Prince Global Sports is committed to continually delivering top-quality tennis products in all categories - outfitting athletes around the world with the very best in racquets, footwear, strings, balls and accessories. The partnership formed with the Bryan’s and Prince is a natural fit. Prince Global Sports, LLC, is a leading court sports company with a focused commitment to research and development and game-changing product innovations. The company is widely recognized as being the first to market with many of the most relevant technologies of the past 40 years. Oversize and Longbody technology, the first multifilament string, the first “Natural Foot Shape” tennis shoe and EXO3 technology, are a few of the contributions Prince has made to the sport. Today, the Company engineers products in all tennis categories including Racquets, Footwear, Tennis Balls, Strings, Grips, Bags, Machines and Accessories. The portfolio of brands within Prince Global Sports includes Prince, Ektelon and Viking. Prince Global Sports is a wholly owned subsidiary of Active Brands Company with offices in New Jersey, London, France, Holland and Taiwan. Learn more information at princetennis.com. Active Brands Company is an Omaha based company focused on advancing innovative branded products for athletes and outdoor enthusiasts through subsidiaries such as Prince Global Sports and Battle Sports Science (battlesportsscience.com), a maker of innovative protective and performance sports products. Active Brands Company is majority owned by Waitt Company. Learn more information at battlesportsscience.com. Waitt Company is an Omaha based investment company with a focus on opportunities to partner with committed owners and proven management teams to support the strategies for growing the enterprise value of their companies. Waitt Company builds effective, long-term relationships with founders, families, and management teams pursuing a variety of risk appropriate strategies for building long-term enterprise value. Learn more information at waittcompany.com.